This prayer map features all 228 nations of the world broken down into a 31-day prayer calendar. The World Prayer Map also contains other helpful tools to guide and fuel your prayers for the nations. This 31-day prayer map helps you focus your prayers on a different state or states each day of the month. The map also contains other helpful tools to guide and fuel your prayer for the United States. 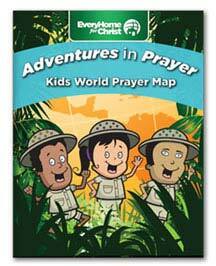 This map features an easy, step-by-step system to help children understand the important aspects of daily prayer. The numbered prayer guide walks them through praying for every nation. Note: We only ship to Continental U.S. addresses, Alaska, Hawaii & Puerto Rico. [Title] Mr. Mrs. Mr. & Mrs. Miss Ms. Rev. Dr. Rev. & Mrs. Dr. & Mrs.